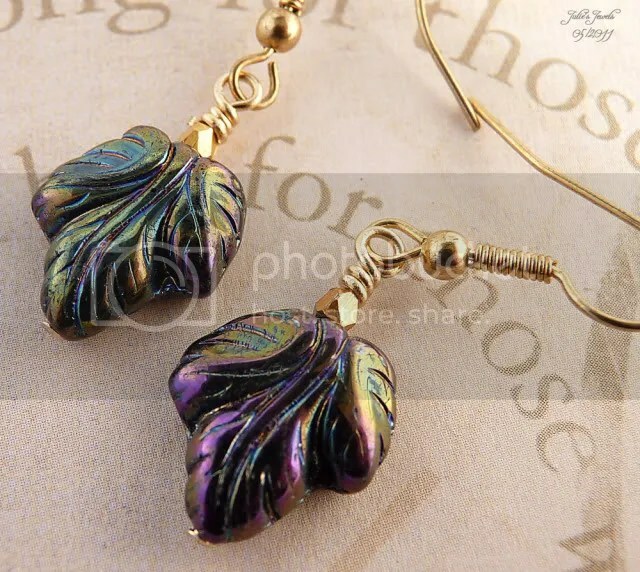 So here is a little pair of earrings for the perfect Fall outfit – stunning pressed Czech Glass leaves and just a touch of gold. 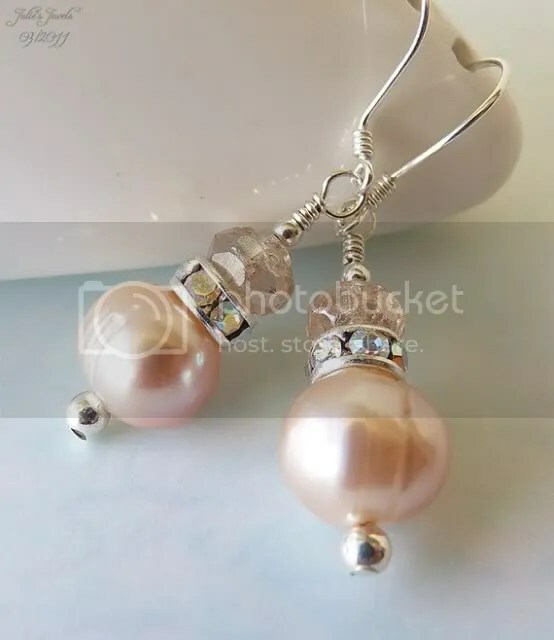 So here we go with the other three pairs of pearly earrings with crystals and rhinestone spacers. 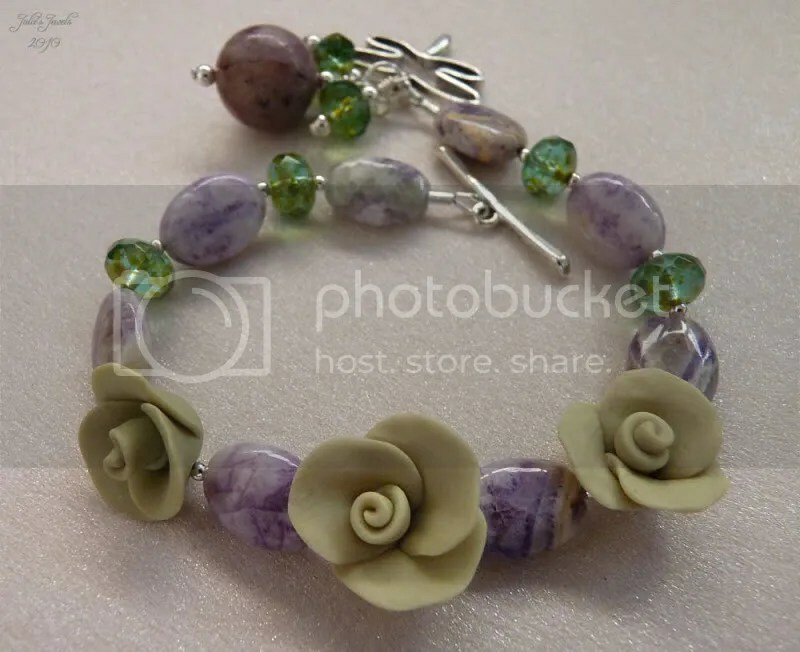 These are all available in my Etsy store. 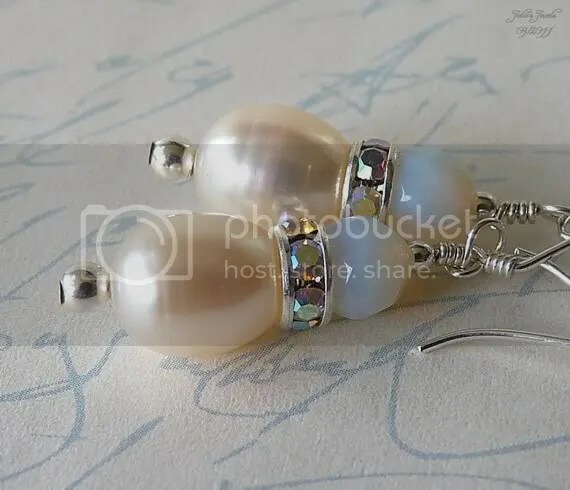 Recently I’ve been making some elegant pearl earrings. 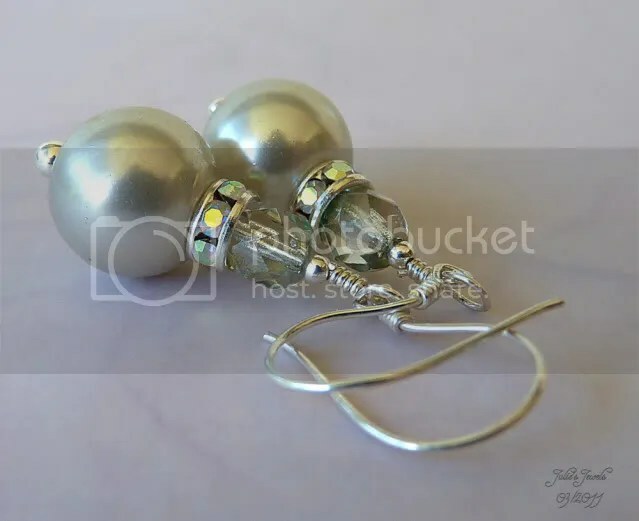 Two of these were made for this Imagination Station banner… Do you think these fit? 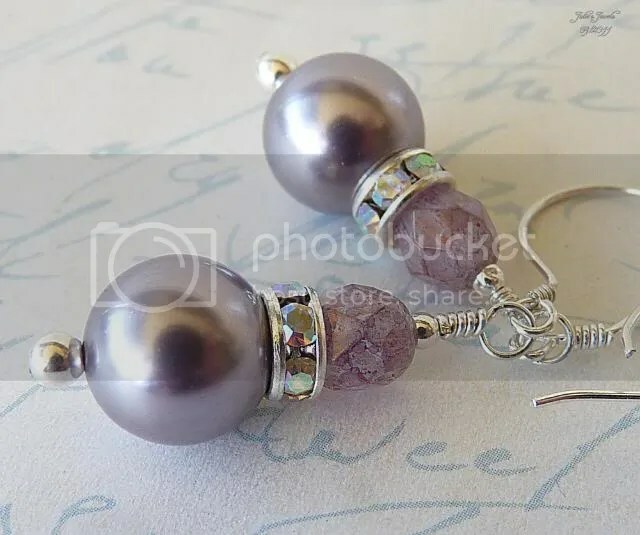 Mauve Earrings – These are made with Swarovski Pearls and Czech Fire-Polished Picasso beads with Sterling Silver and Diamente spacer. 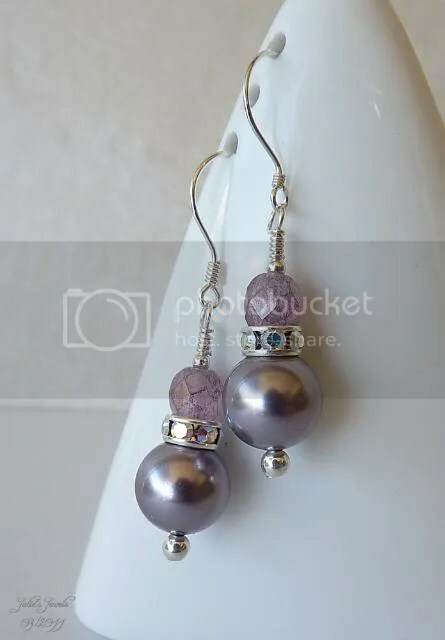 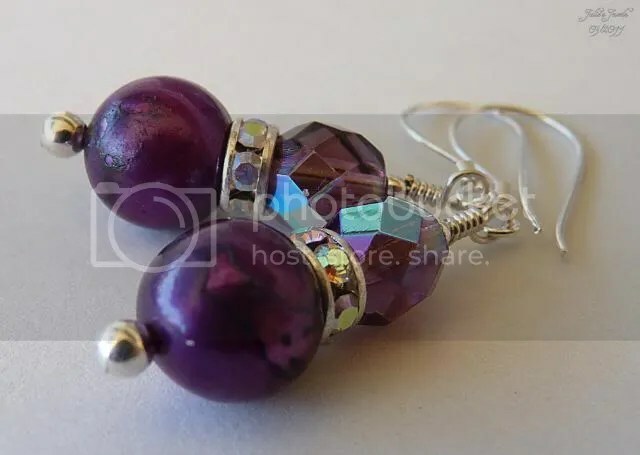 Deep Purple Earrings – Have been created with Potato Pearls and Czech AB beads with Sterling Silver and Diamente spacer. 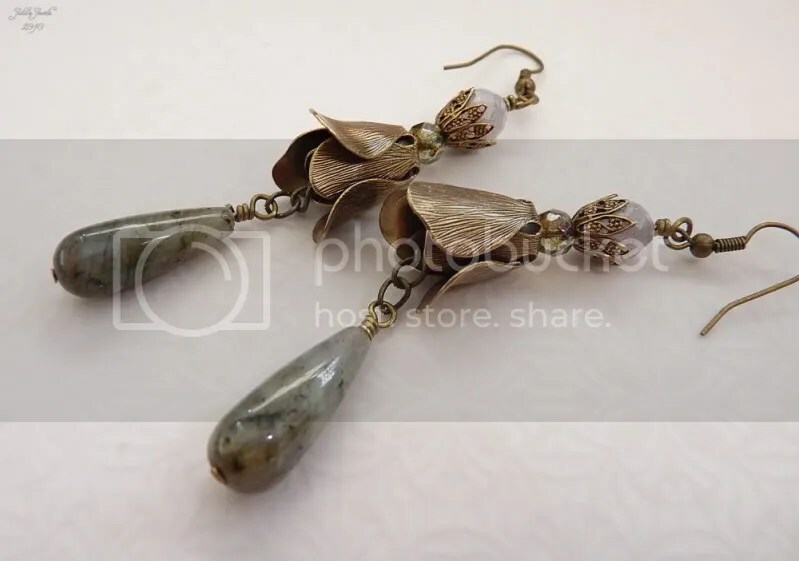 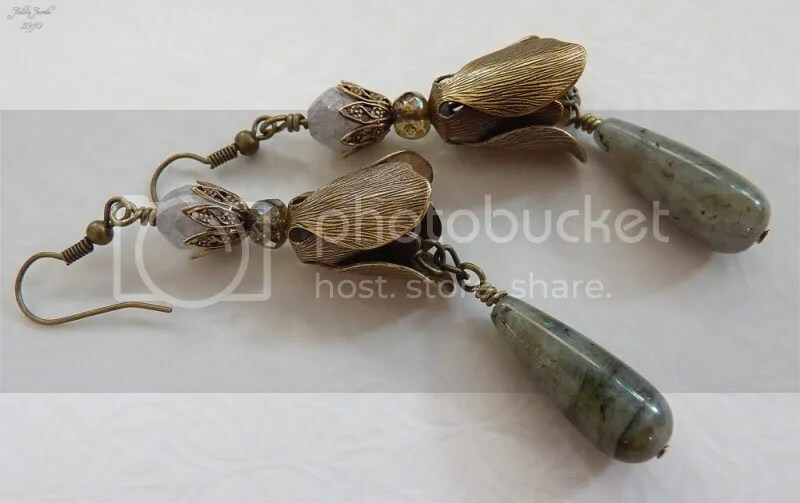 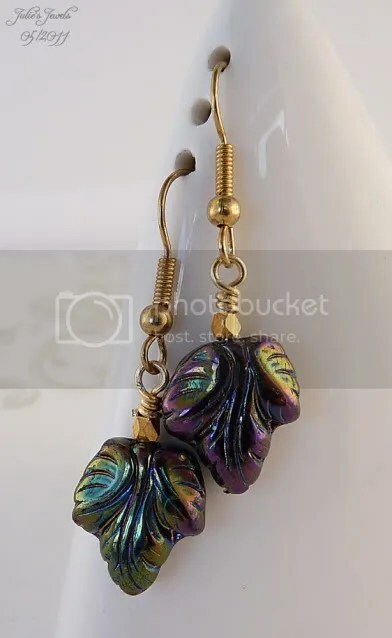 Charming Oxidized Brass Tulip caps with shimmering Labradorite and Czech Glass beads make for a stunning pair of earrings. 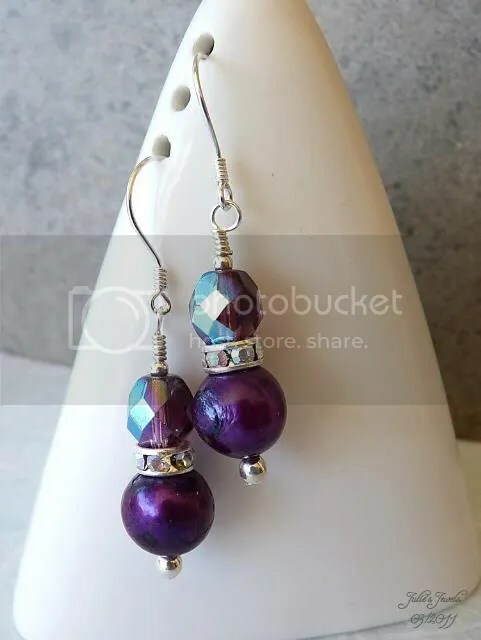 I have a beautiful bracelet and earring set – made with beautiful Charoite beads, such a glorious purple shade. 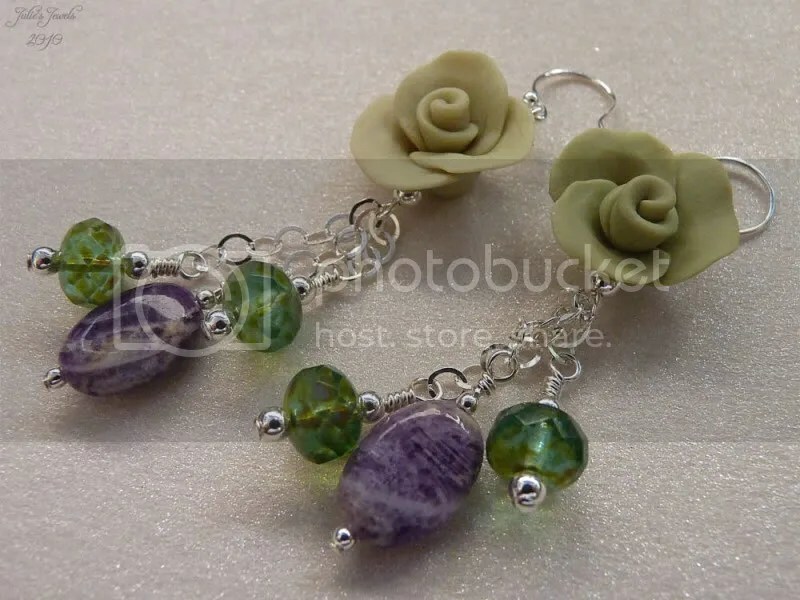 Also polymer clay roses, so beautiful, stunning czech glass and of course sterling silver. 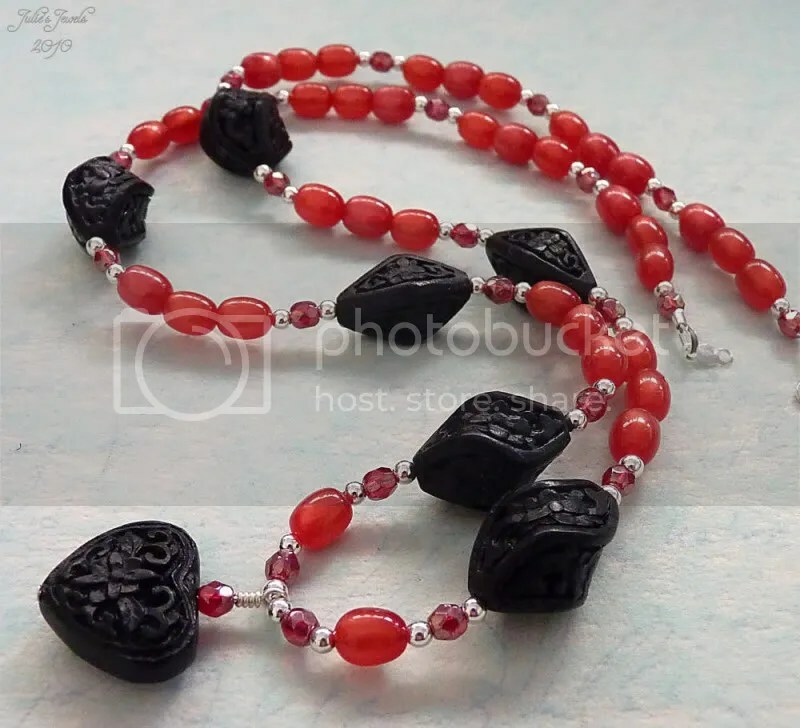 Traditionally black and red is the colours of Scorpio, which came to mind while I was putting together this necklace. 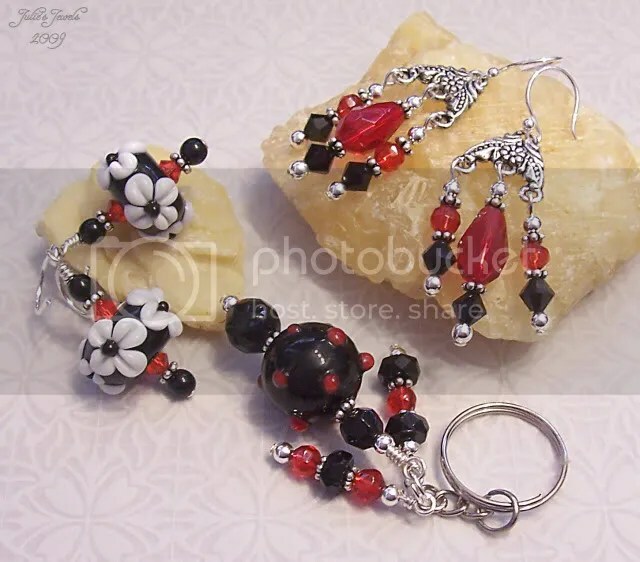 Interesting black Cinnabar together with lush red Moonglow Lucite and Czech Glass beads all highlighted with Sterling Silver. 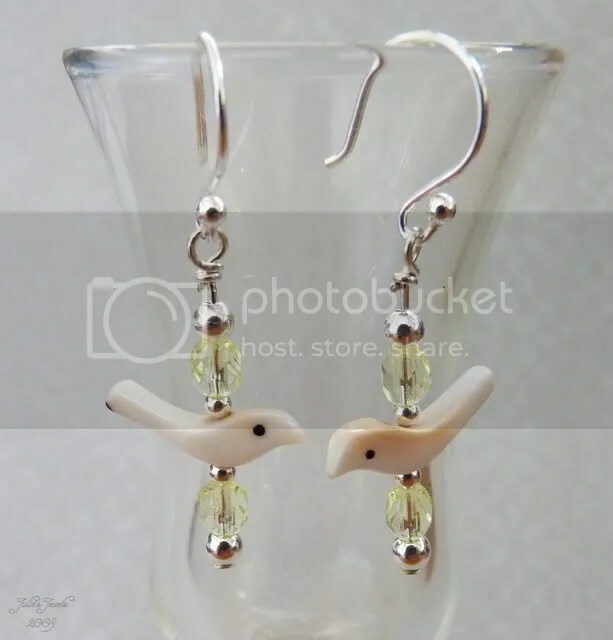 A cute little pair of birds sitting in a lovely green bush. 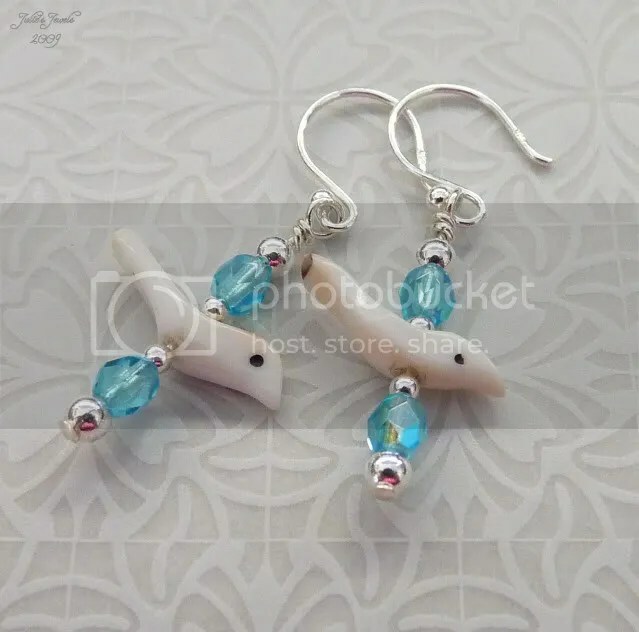 …and one in the sky! 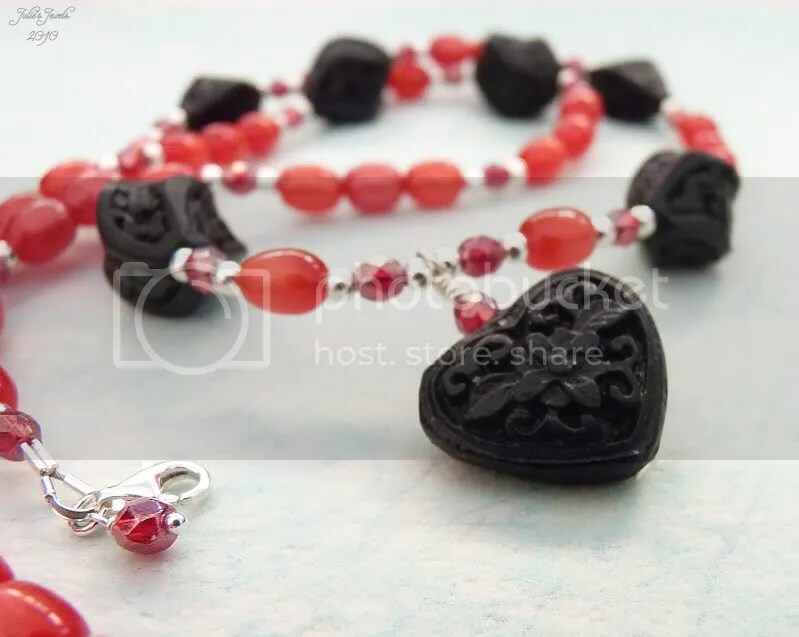 Tish’s favorite colours are Red, Black and White and she prefers Silver and LOVES earrings. 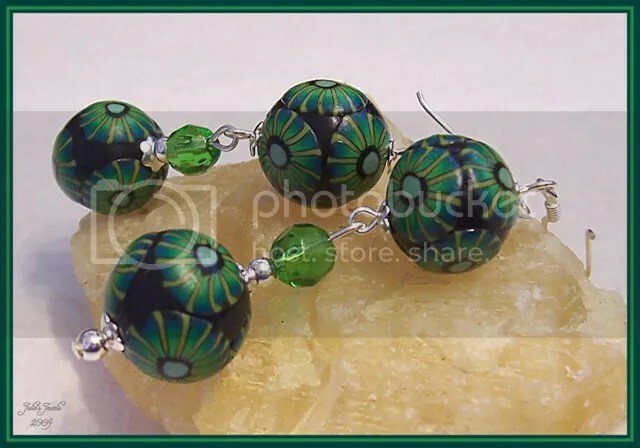 They are all created with a mixture of Lampwork, Swarovski Crystal, Czech Glass and other beads. 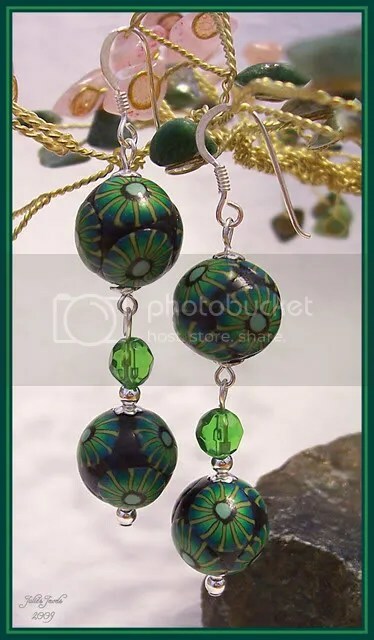 She loved her new jewels – in her words — My goodies arrived today, thanks so much, they are beautiful!! 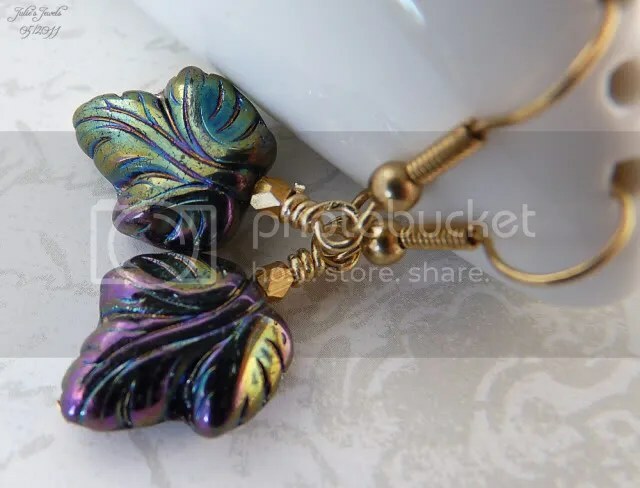 Thank-you Tish – this is really a gorgeous scarf and so warm. 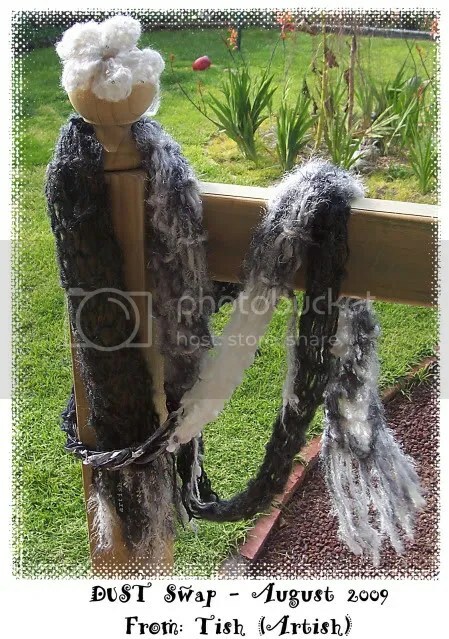 For the last two swaps now I have received scarves – I wonder what Swap number 6 will bring in September/October?